Sakor Technologies (USA) has presented its stator/alternator test system at the Green Car congress. It is intended for dynamometer testing. The dynamometer testing system is suitable for testing starter/alternators for hybrid/electric vehicle (H/EV) applications. It consists of the 42-kW Accudyne AC motoring dynamometer and features the Dynolab test automation controller. 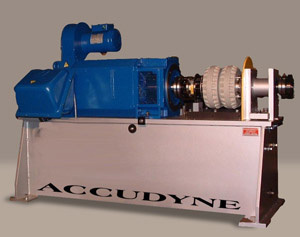 The Accudyne dynamometers offer 4-quadrant operation with seamless transition between loading and motoring modes. The system communicates with the customer’s ECU via CAN. The test system is capable of operating at speeds as high as 18 000 rotations per minute and as low as standstill providing full torque in a stall condition. Furthermore, the dynamometer can run in motoring or loading modes at maximum rated torque/power in either direction at any time, and can switch between these modes instantaneously. As a result, the test system can expose starter/alternators to all possible conditions they may undergo in actual vehicle use. The test system offers the ability to test the maximum power, speed, and generator capacity of starter/alternators. In addition, the system allows operators to run road load cycles to simulate real world conditions, including starting the engine, dynamic braking, power assist, and battery charging modes. The cost of operations of the test cell is also reduced, because the system is capable of power recapture and therefore uses much less electrical energy over the testing cycle.